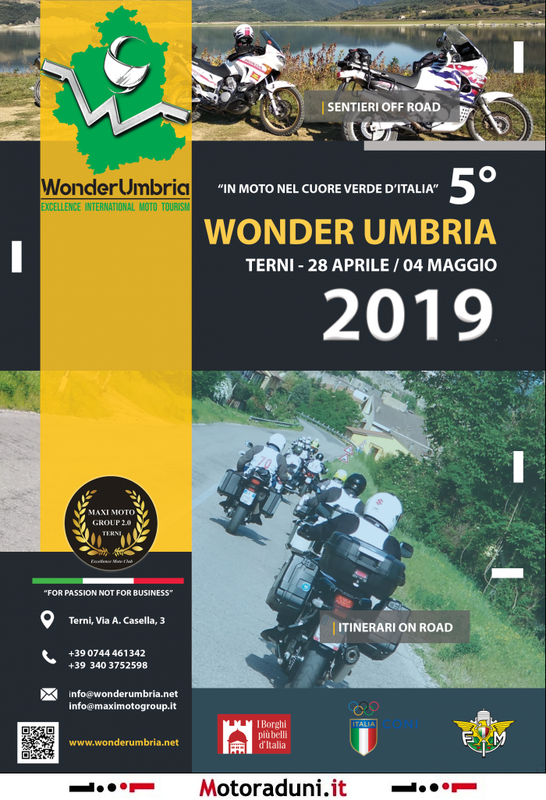 WONDER UMBRIA IN MOTO NEL CUORE VERDE D’ITALIA ALL’INSEGNA DI MERAVIGLIOSI PERCORSI NATURALISTICI E SENTIERI SELVAGGI CON PANORAMI MOZZAFIATO FRA CITTÀ D’ARTE, STUPENDI CENTRI STORICI E RELIGIOSI, CARATTERISTICI PAESINI E OTTIMO CIBO. 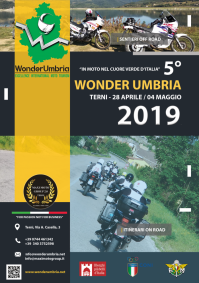 WONDER UMBRIA È UNA MANIFESTAZIONE MOTOCICLISTICA, NON COMPETITIVA, TURISTICO/SPORTIVA A CARATTERE INTERNAZIONALE CHE SI SVOLGE SU STRADE APERTE AL TRAFFICO, ASFALTATE (ON ROAD) E NON ASFALTATE (OFF ROAD) PER DUE CATEGORIE DISTINTE DI MOTO. È APERTA A TUTTI I TIPI DI SCOOTER, MOTO E SIDECAR ATTUALI E D’EPOCA CON CILINDRATA SUPERIORE A 120 CC. IN POSSESSO DI PATENTE CHE ABILITI ALLA GUIDA DEL MOTOVEICOLO CON CUI SI INTENDE PARTECIPARE.